Openers Smriti Mandhana of India and Danielle Wyatt of England have achieved career-best positions in the MRF Tyres ICC Women’s T20I Player rankings after their three-match series in Guwahati, which the visiting side won 3-0. 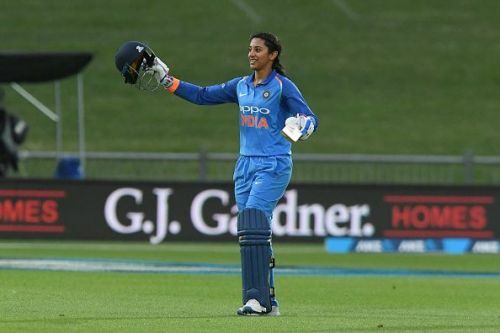 Mandhana, the top-ranked ODI batter who led the T20I side in the absence of Harmanpreet Kaur, has gained three slots to reach third position among batters after scoring 72 runs in the three matches while Wyatt’s player of the series effort of 123 runs has helped her gain two slots and reach 17th in the list. Tammy Beaumont and captain Heather Knight have also gained two places each to reach 26th and 33rdrespectively, while Lauren Winfield (up eight places to 45th) and Sophia Dunkley (up 16 places to 86th) are the other significant gainers in the latest rankings update carried out on Sunday. Among bowlers, Radha Yadav has gained five slots to reach fifth position after grabbing three wickets from two matches while other left-arm spinner Ekta Bisht has also finished with three from two to gain three places and reach 56th in the list. Off-spinner Anuja Patil has moved up from 35th to 31st position. England spinner Linsey Smith’s five wickets in the series have helped her gain 185 slots to reach 95thposition while Catherine Cross has re-entered the rankings at 71st place after finishing with four wickets in the series. Meanwhile, England have overtaken New Zealand to reach second position in the MRF Tyres ICC Women’s T20I Team Rankings, gaining three points to reach 277 points, six behind leaders Australia.